What Does It Mean To Be A Sig? 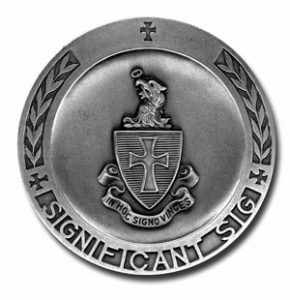 Sigma Chi is unique among Greek organizations. Not only have we grown for over 150 years through wars, depressions, and dramatic changes in the college scene, but we have also remained true to the Seven Virtues honoring our founders, and the Three Great Aims of our Fraternity- Friendship, justice, and learning. These Principles unify us and drive our personal ascent. we are an organization dedicated to the development of our members, evidenced by the extraordinary leaders that have emerged from our ranks. Sigma Chi is the largest Greek lettered fraternity in the world. Sigma Chi has initiated over 300,000 brothers into the fraternity, and currently has 233 undergraduate chapter, along with 126 alumni chapters. Greeks contribute over $7 million and 850,000 hours to charity/ community service annually.